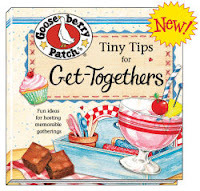 Have you heard about the new Tiny Tips books by Gooseberry Patch? These books are ADORABLE- like anything coming out of the Gooseberry Patch farm isn't adorable, right? Oh I digress but as always I'm a huge fan of their cookbooks and now a new fan of their Tiny Tips books. 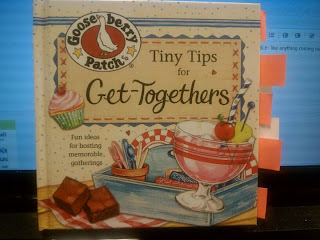 I had the pleasure of reviewing Tiny Tips for Get-Togethers and Tiny Tips for Gifts to Make & Give. These are 100 page books, jammed packed with quick & creative tips and quotes complied for their given subject. As always, I brought out a pack of sticky notes to go through the Tiny Tips books. These are hard back books, just the right size to stick in your purse to have something handy to read when you have a few minutes here and there. The Tiny Tips for Get-Togethers was a perfect book for me because whenever possible I do love to toss together a get-together. I'm always looking for new ideas to try and to share with others. How about you? Do you have any "tiny tips for get-togethers?" I'd LOVE to hear them. Leave a tip and then go enter the Gooseberry Patch Big Book of Home cooking Giveaway. Hurry it ends 9/23/2011. Don't forget to pick up these Tiny Tips books for yourself or for gifts for others!